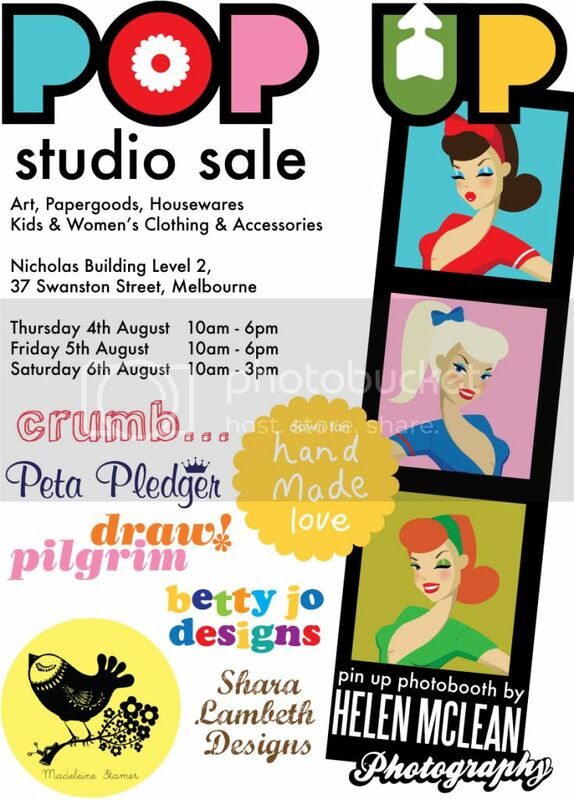 Melburinans, if you are heading into town this week, make sure you pop into the Nicholas Building to visit some of my talented friends who are having a Studio Sale on Thursday, Friday and Saturday. I won't have a stall, but will catch the tram into town on Friday to say 'hi'. Emma will be so excited about catching the tram, she usually says hello to everyone and asks for tickets, then she sings very loudly so even the grumpiest of passengers end up with a smile on their faces. New sponsor Madeleine Stamer of Little Circus design will be there with her artwork and mobiles. Emma has some of Madeleine's work decorating her room, but I'm thinking that I may need some for me too. And of course I will swoon over Pilgrim's prints and Peta's lovely clothes. So I might see you there then?